Beautiful sounding cables, giving a feeling of space to the musical presentation. The Standard range of cables is the perfect example of quality at an affordable price. And will make even the very modest of system sound better. The Standard range of cables employs OFC 99.99%, 24K gold-plated connectors, and AirGap isolation. This allows you to hear the music as was meant to be heard. After construction, the cables are subjected to a ‘Burn-in’ procedure (using three carefully chosen frequency sweep programs). An Anti-static treatment process and made ready for shipping. 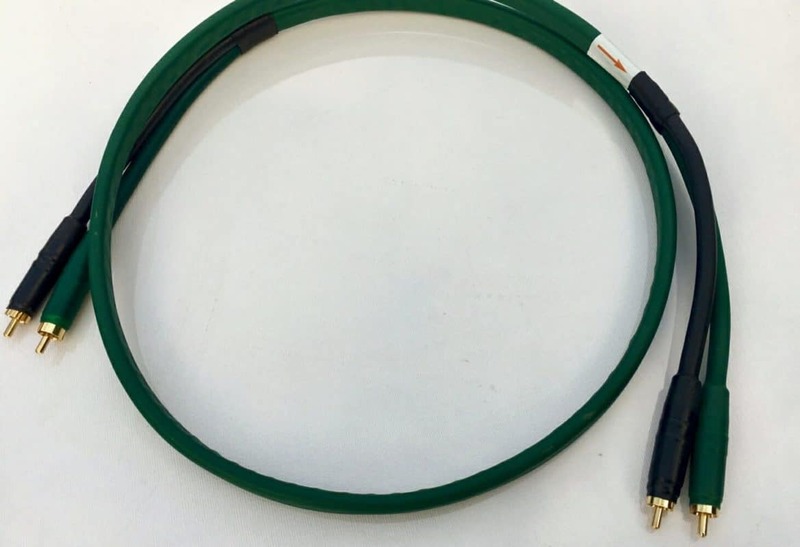 The Loudspeaker cables are a single connection and have an additional outer layer, which provides for the ‘AirGap’ cushioning. The cables are OFC red copper and terminated with 24K direct gold plated banana connections. These connections have double screws which avoid soldering and allow maximum performance. Cable specification ~ Conductors: O.F.C Red Copper ~ Insulation: Compact PE ~ Shield: Spiral covered O.F.C red Copper ~ Sheath: PVC ~ Outer sheath: Plastic shrink-wrap ~ Cable Diameter: 6.0 mm ~ Conductor size: 2 x 0.25 mm2 (23 AWG) ~ Conductor number: 8 x 0.2 mm ~ Resistance: 0.075 Ohms/meter ~ Capacitance: 55 pF/meter ~ Certificate: CEI 20-22/II°, RoSH 2002/95/EC, 2011/65/UE. The Bi-wired loudspeaker cables connections are made using 24K direct gold plated double screwed barrels. Termination is with 24K direct gold plated banana connections. The cables provide a rich full sound and improved detail from the musical presentation. Bi-wired cables allow more information to be transmitted adding to the beauty of the sound. 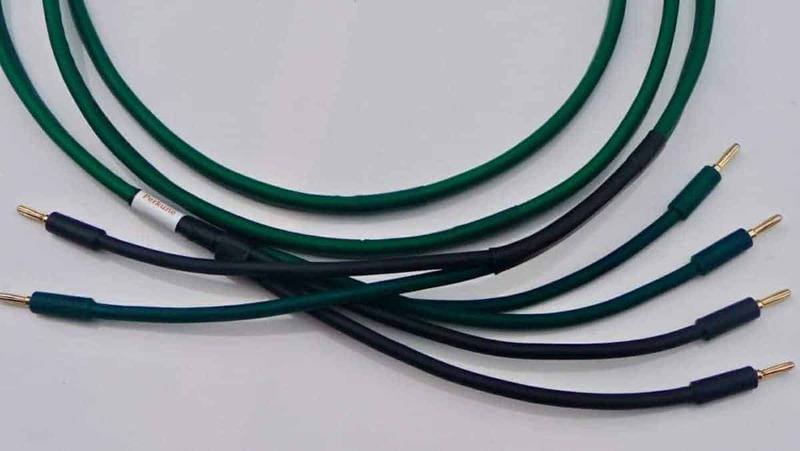 Conductors: O.F.C Red Copper ~ Insulation: Vinyl ~ Outer sheath: Plastic shrink-wrap ~ Cable Diameter: 6.0 mm ~ Conductor size: 2.5 mm2 (13 AWG) ~ Conductor number: 7 strand – each strand containing 32 x 0.125 mm ~ Resistance: 0.02 Ohms/meter ~ Capacitance: 75 pF/meter. Certificate: CEI 20-22/II°, RoSH 2002/95/EC, 2011/65/UE. Jumper cables are the perfect solution for achieving the exceptional sound. This is done by replacing the standard, bent metal plates and generic wires supplied with most bi-wire loudspeakers. The design provides a straight-line, low-loss jumper that ensures optimum results. 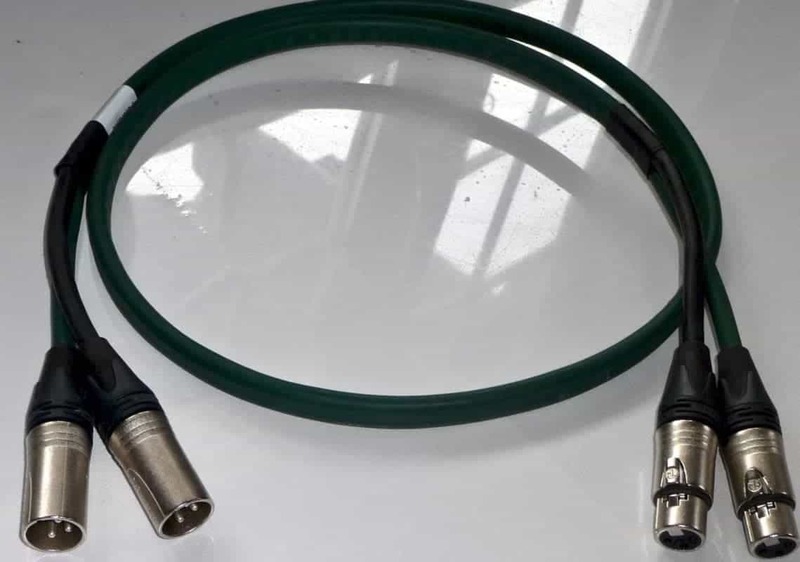 The Jumper cables are supplied with banana/banana connection, which is ideal for a person who is using loudspeaker cables with spade connections. The Jumper cable set also comes with 4 spade connections that allow for mix and match! Cable specification ~ Conductors: O.F.C Red Copper ~ Insulation: Compact PE ~ Shield: Spiral covered O.F.C red Copper ~ Sheath: PVC ~ Outer sheath: Plastic shrink-wrap ~ Cable Diameter: 6.0 mm ~ Conductor size: 2 x 0.25 mm2 (23 AWG) ~ Conductor number: 8 x 0.2 mm ~ Resistance: 0.075 Ohms/meter ~ Capacitance: 55 pF/meter ~ Certificate: CEI 20-22/II°, RoHS 2002/95/EC, 2011/65/UE. The Standard range RCA Interconnect is a neutral cable and terminated with 24K direct gold plated connections. The cable is open and revealing and designed to give maximum performance at a minimum price. The Interconnect is flexible and easy to use. Conductors: O.F.C Red Copper ~ Insulation: Compact PE ~ Shield: Spiral covered O.F.C red Copper ~ Sheath: PVC ~ Outer sheath: Plastic shrink-wrap ~ Cable Diameter: 6.0 mm ~ Conductor size: 2 x 0.25 mm2 (23 AWG) ~ Conductor number: 8 x 0.2 mm ~ Resistance: 0.075 Ohms/meter ~ Capacitance: 55 pF/meter ~ Certificate: CEI 20-22/II°, RoSH 2002/95/EC, 2011/65/UE. The One-meter Standard range interconnect is a balanced cable and fitted with XLR connections. A balanced cable will show detail and precision in your system and the extra money you pay for this cable is well worth the results. The turntable is one of the most respected pieces of equipment in your system and the sound from Vinyl can never be replaced. A true Audiophile always wants the best from his or her turntable and always takes the time and sets everything up to perfection. There are so many steps to take and so many vacations when dealing with a turntable and a person will always use the best cartridge he or she can afford. Everything starts with the power and it is essential to have a good power cord (as this is often neglected). 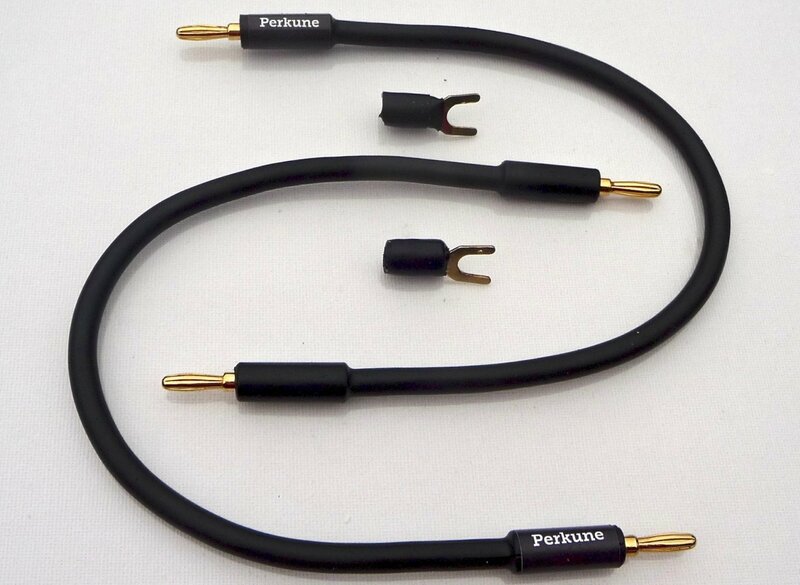 Perkune Power cords allow the system to realize the full potential by simply giving the components what they need. The three-meter Standard power cord provides blacker background and increased dynamic range, is fitted with ‘AirGap’ isolation and ideally suited for your power conditioner. 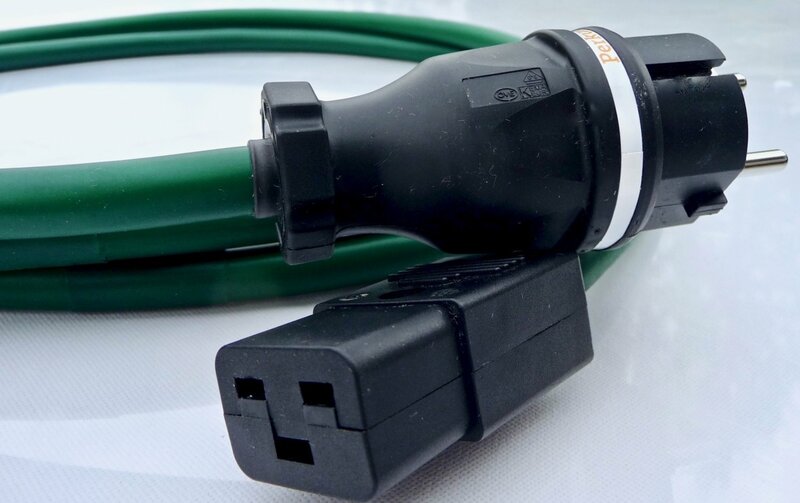 The Standard power cord is fitted with Industrial Shucko (impact resistant) tamper proof connector and IEC 60320 C-19 (Impact resistant), 21 Ampere-250 Volt 2 Pole-3 wire grounding (2P+E) connector. The two-meter power cord delivers a level of performance not previously possible at this price and ideally suited for your power amplifier. 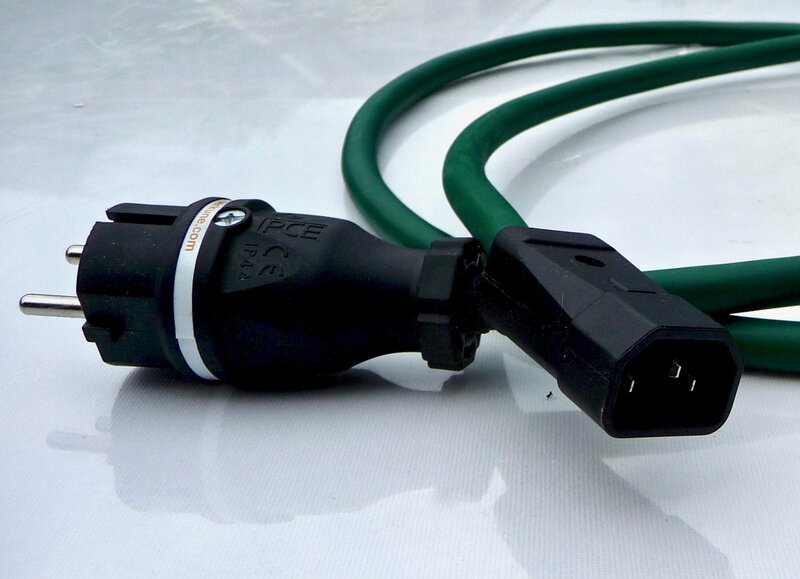 The power cord has single level ‘AirGap’ shielding and supplied with Industrial Schuko tamper-proof connection and either the IEC C-14 male or C-13 female 15 Ampere-250 volt 2 pole-3 wire grounding (2P+E) connector. 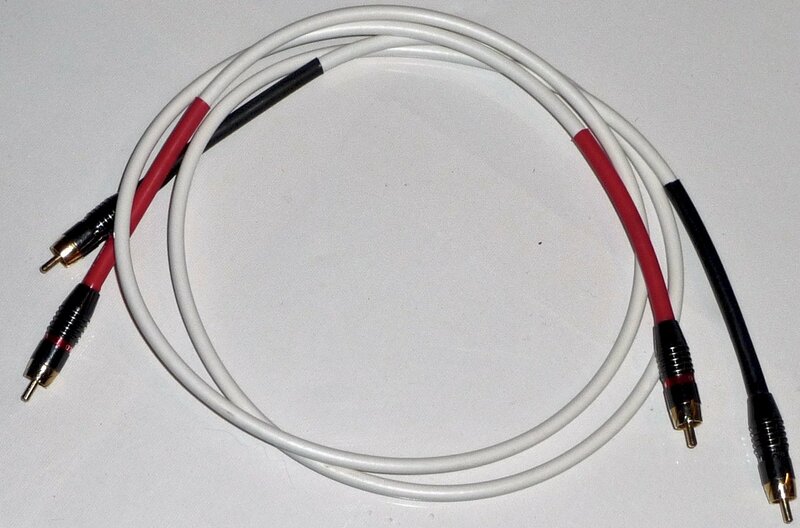 Conductors: OFC - 3 x 2.5 mm2, Resistance: 9.9 ohms / Meter. Rated voltage: 300-500 Volts. Test Voltage: 2 Kilowatts. Temperature: -15 to +70 Centigrade. Sheath: White PVC. Outer sheath Shrinkwrap. Insulation: HD 308 S2. Certification: H05W-F:EZU, RHOS, REACH ~ Self Extinguishing: IEC60332-1-2. I have used one of your cables and can say that they are brilliant sounding and with your new intro range I would say to anyone buying these you would get the same great sounding cable, go for it. So what is the difference between this range of cables and the ultimate Gokd range. What difference for the price ?